The Cruise Holiday Shop is Bolsover Cruise Club’s first retail outlet. Since opening in 2014, this state-of-the-art store has allowed our valued customers to plan their perfect cruise holiday outside of the limited 10am-4pm Monday to Saturday opening times of our Cruise Bureau. Where is The Cruise Holiday Shop? 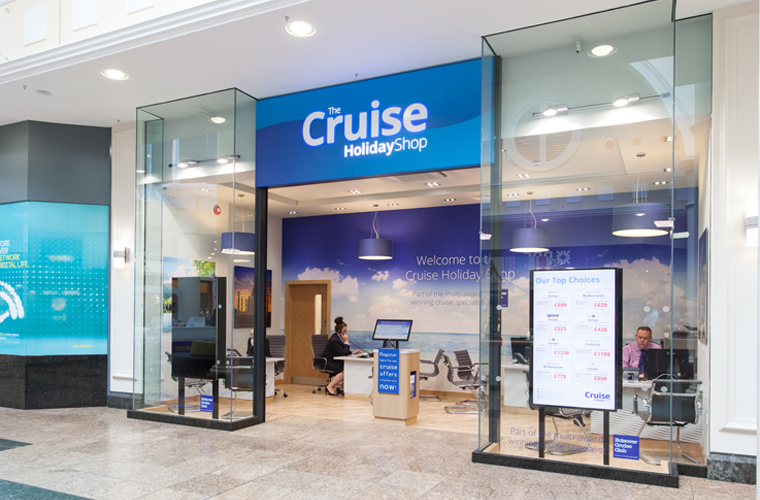 The Cruise Holiday Shop is located within Yorkshire’s busy Meadowhall Shopping Centre. The shopping venue covers 1.4 million sq ft of floor space with 280 stores to browse along with 50 dining options to choose from. Free parking is available with 12,000 spaces across the site and Meadowhall is also accessible via direct access rail, road and tram. Visit us at 36 The Arcade, near the main entrance and Customer Services desk on the Upper Arcade. How does The Cruise Holiday Shop work? Bolsover Cruise Club is the UK’s leading independent cruise agent and you’ll enjoy every aspect of our dedicated customer service when you visit us in store at The Cruise Holiday Shop, regardless of whether you’re booking your very first cruise or your hundredth. A team of 12 expert Cruise Experts are on hand seven days a week, ready to discuss your next cruise holiday and the latest cruise deals. Whether you’re looking for a last minute break or planning the trip of a lifetime, our dedicated Cruise Experts can advise on every single aspect. With interactive touch-screen facilities, plenty of cruise brochures and endless cruising knowledge from our expert team, The Cruise Holiday Shop has everything you need to book your perfect trip. What are The Cruise Holiday Shop opening times? The Cruise Holiday Shop at Meadowhall is open from 10am until 9pm Monday to Friday, 9am to 8pm Saturday and 11am to 5pm Sunday, and there’ll always be a friendly face ready to talk travel at a time to suit you.